Another gem on Scriptorium, this time from R. A. Torrey (i.e. Fred Sanders posting something from Torrey). 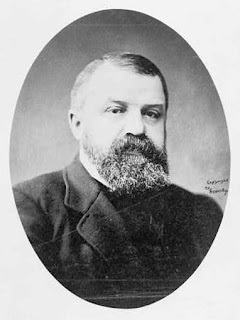 Today is D. L. Moody's birthday, and Torrey has posted his essay (originally a sermon?) on why God used Moody. It is long, but go read all of it. This piece is easily one of the most encouraging things I've read on a blog in a long, long time. Especially if you are a young man like me, you need to go read this post. I really cannot recommend it much higher. I pray that God would raise up more of us like Dr. Moody who are so committed to the Lord's work with total surrender to Him, with prayer, Bible study, humility, freedom from the love of money, commitment to reaching the lost, and the special endowment of God's power. Encouraging, challenging and quite different from what we learned in the post a few days ago, The Seeker Movemement.